lt;stronggt;IVR46848lt;/stronggt;lt;BR/gt;Innovera DVD-RW Discslt;BR/gt;Rewritable disc offers incredible flexibility and convenience. Leave disc open to add data, or close it to make data permanent for flexible data management. High capacity makes it the ideal media for use in graphics and advertising, software development, video recording, and more. Durable disc can be rewritten up 1,000 times. Easy to write on surface for quick, clear labeling. Includes durable jewel case to protect disc when not in use. 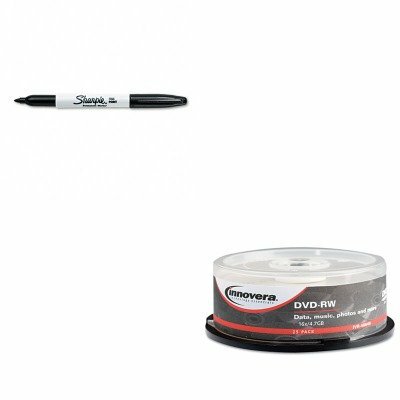 Disk Type: DVD-RW Capacity Video: 120 min.lt;BR/gt;lt;BR/gt;lt;stronggt;SAN30001lt;/stronggt;lt;BR/gt;Innovera DVD-RW Discslt;BR/gt;This fine tip permanent marker is the original Sharpie. Permanent on most hard-to-mark surfaces. Quick-drying ink is waterproof, smearproof and fade-resistant. Marker Type: Permanent Assortment: N/A Colors: Black Tip Type: Fine.